Enjoy the fascinating history of Fort Tejon, an historic site in Southern California where reenacting comes alive! For an outstanding interactive tour of the Gettysburg battlefield, we recommend you check out Stephen Recker's Virtual Gettysburg at www.virtualgettysburg.com. The Inland Empire CWRT meets at 6:30 pm on the second Wednesday of the month (except February) at the Lincoln Shrine, 125 Vine Street, Redlands, CA. For information call (909) 798-7632, or visit their website at www.iecwrt.com. The Orange County CWRT meets at 7:00 pm on the third Tuesday of the month at Carrow's Restaurant, 16931 Magnolia St., Huntington Beach, CA. Contact Sue Sweet at sweetsstar@aol.com for details and directions, or visit their website at www.cwrtorangecounty-ca.org. The San Diego CWRT meets at 7:30 pm on the third Wednesday of the month at the Palisades Presbyterian Church, 6301 Birchwoood St., San Diego. Contact David Tooley at djsj21643@aol.com for details and directions, or visit their website at www.sdcwrt.org. 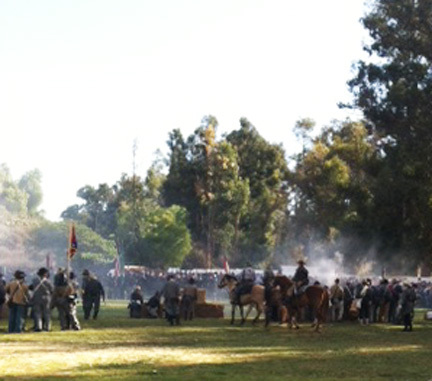 The Imperial Valley Civil War Round Table meets on the first Thursday of each month at 7:00 p.m. in the Old Rose Schoolhouse at Pioneers Museum, 373 East Aten Road, Imperial, CA. Call Dennis Gibbs at (760) 355-4688 for information and directions, or e-mail him at dennisgibbs@adelphia.net. The Bakersfield CWRT meets on the third Thursday of each month. Call Jerry Kirkland at (661) 397-3605 for location and program information. 1700 Coyote Point Drive, San Mateo, CA. You can e-mail them at PeninsulaCivilWarRoundTable.org, or visit their website at www.peninsulacivilwarroundtable.org.